"It is not real 4K in any material way due to having a final master at 2K." 1. Its the best quality version of the film currently available. 3. The current price of this is basically the same price as the blu ray version regularly sells for. 4. Cracking price for a 4k film, even if its not to everyones taste. Unmissable Alien franchise entry, heat! I must be one of the few that really enjoyed it. 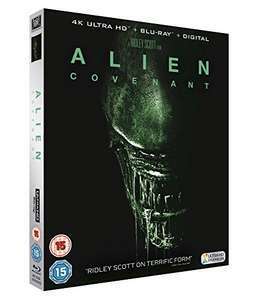 I would add heat for the price, but when the director of the original film seems to be taking his cue from the AvP films it's a sad thing to see. Gore, but not much more. Also how stupid were that crew? Step on this, sniff that, slip on that, drop gun, break ankle, look in egg, have shower. They all deserved what they had coming to them. Ridley Scott has lost the plot - literally. Main problem for me is this, and Prometheus, focus more on Androids than the Aliens. The Alien bits are shoehorned in, and the movies are worse for it. If you remove the Aliens from the films and just focus on the androids, the films probably wouldn't be half bad. But as Alien films, they are awful, and thats saying something in a universe which includes those horrible AvP films. That real or fake site is not accurate. I have this film and it is amazing looking in 4k and HDR. Find some reviews to check whether it is real 4k rather than that website.